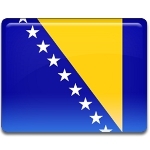 During its long history Bosnia and Herzegovina was a part of the Ottoman Empire, the Austro-Hungarian Empire, the Kingdom of Yugoslavia and the Socialist Federative Republic of Yugoslavia. 1991 was the year when Yugoslavia started to break-up. On January 9, 1992 Serbian Rebulic of Bosnia and Herzegovina was established and later in August 1992 changed its name into the Republika Srpska. Republic Day is one the most important holidays in the Republika Srpska. This day coincides with St. Stephen's Day (Julian calendar). The Orthodox Serbs regard St. Stephen as the patron saint of their republic and often call this day as the Slava of Rebublika Srpska. As far as this holiday also has got a religious dimension, it is celebrated with special services in Serbian Orthodox churches.